Eyewitness account: A new witness in the police shooting death of Michael Brown told CNN that Brown and the police officer tussled with each other before the officer shot the teen multiple times as Brown backed away. Police in Ferguson, Missouri, have said Brown died in a dangerous struggle after trying to grab the officer's weapon, but witnesses say that it seemed a brazen act of aggression by the officer Saturday and that Brown was unarmed and not threatening. Protests have erupted each night since the shooting. Missouri's governor will visit the community near St. Louis today. Humanitarian crisis: A mass evacuation of Yazidis in northern Iraq seems unlikely now that the U.S. has evaluated the situation. Last week, the minority group was chased from the town of Sinjar by ISIS, which calls itself the "Islamic State" and was known as the Islamic State in Iraq and Syria. Once believed to be in the tens of thousands, the number of Yazidis in Iraq's Sinjar Mountains is "now in the low thousands," the State Department said. Still, the United Nations has announced its highest level of emergency for the humanitarian crisis, saying the 400,000 people on the run from ISIS are of grave concern. Cease-fire extended: Israel has accepted an Egyptian proposal to extend the current cease-fire five more days, an Israeli government spokesman said today. Earlier, Palestinian officials said they had agreed to extend the truce. Israeli and Palestinian delegations have been talking in Cairo, using Egyptian go-betweens, in hopes of ending hostilities that have killed more than 2,000 people. But there's still lots to work out. Israel says it wants Gaza demilitarized. The Palestinian delegation is demanding an end to Israel's economic blockade on Gaza and the release of prisoners held by Israelis. Intriguing case: An American woman and her boyfriend have been named suspects in the death of her mother after her body was found stuffed in a suitcase, police in Indonesia said. Sheila von Weise Mack had been staying at the posh St. Regis Bali Resort with her daughter, Heather Mack, and the daughter's boyfriend, Tommy Schaefer. The couple say they were taken captive by an armed gang that killed Sheila von Weise Mack. They say they managed to escape. As suspects, police can hold them up to 20 days while they investigate. Rough waters: SeaWorld isn't having a good time these days. Shares of the theme park operator plunged nearly 33% Wednesday after it reported weak earnings and lackluster attendance for the year, especially at its flagship destination theme parks in San Diego and Orlando. SeaWorld Entertainment said it expects revenue to drop 6% to 7% for the year. That's a lot worse than Wall Street expected. SeaWorld has come under fire after the airing of "Blackfish" last year, a CNN documentary that exposed the alleged dangers of keeping orcas in captivity. - Make it come back: Oh, the joys of technology. This little girl is heartbroken after deleting a picture of her uncle. - Raising cold, hard cash: The Ice Bucket Challenge for ALS research. - Dating deal breakers: What's yours? - Disconnection hell: This guy says his cable provider put him on hold for more than three hours when he tried to cut service. - Say goodbye to Hollywood: With the passing of Lauren Bacall this week, all 16 of the Hollywood icons named in Madonna's hit song "Vogue" have died. 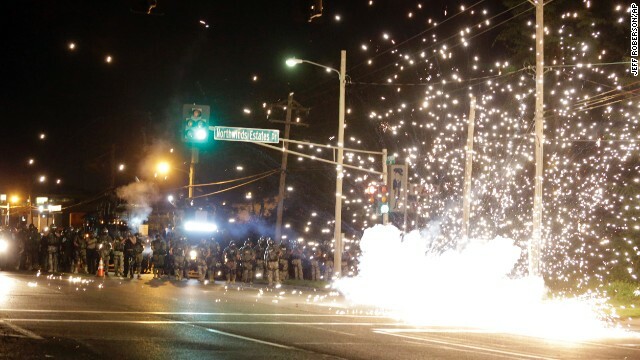 You're correct in that rioting is (almost) never justified. Killing a boy in cold blood while in the role of "protector", is far worse. Too bad you're more worried about the store owners (who have insurance) rather than real justice for a killer who hides behind a "badge". The fact that an "all-white" (except for 3 token Blacks) police force "governs" a town that is 70% or higher of Black people, suggests a serious racial undertone that would undermine any investigations or the "peace" officer role. "Peace Officer" is a term from days past when that was their job, "keeping the peace". Today that role is called a Militarized Police Role (the former specialized SWAT is now SOP for "Peace Officers" what a joke) who dress like Military Combat Soldiers instead of PEACE OFFICERS, MP's whose job description has been altered from "serve and protect" to judge, jury & executioner. People RIOT when they feel they have NO ALTERNATIVE to voice/vent their JUSTIFIED ANGER AGAINST KILLER COPS, and a system that protects them and not the victims. The system down (Missouri) there is designed to "protect the old boys (white) clubs", not administer any real justice (or we'd see the entire GOP club behind bars). But, even sheep get ornery when cornered. Prayers to the families of Mr. Brown, this should never have happened. PERIOD. May you get your justice. The brothas and sistas are just using the shooting in Ferguson as an excuse for stealing, looting, rioting.....How about the man was breaking the law!!! How about listening when an officer asks you to get off the street because it is dangerous and AGAINST THE LAW TO JAY WALK!!! As for the friend "Dorian", what a liar, the lawyers and AL did a terrible job of coaching that guy, a blind man could see he was lying. But all the Black folk just keep defending people who just can't seem to understand that there are laws to abide by!!!!! WOW!!!!!!!! OMG!!!!!!!! LOL!!!!!!!! Who in their right mind stays on hold for THREE HOURS????????!!!!!!!! He had to be pissed beyond pisstivity with his cable provider!!!!!!!! LOL!!!!!!!! The residents of Ferguson, Missouri need to stop using Michael Brown's death as an excuse to loot innocent store owners. It's disgusting seeing smiling people leaving stores with stolen merchandise. Those hard working men and women aren't responsible for that young man's death. Now for something to make me smile: the little girl through her tears telling her uncle that she made his picture go away FOREVER. Too precious and so innocent. Gestapo police and SWAT teams are arresting reporters for reporting the news. True that the residents should stop looting their own neighborhoods, but the rioting in completely justified. The authorities have overstepped their bounds and deserve to be thrown out of power. The mayor and the police have been acting in a criminal manner, and should be treated like criminals.